Hello and welcome to the 222nd instalment of the SWD. The Syrian Democratic Forces continued its operations against the IS in Raqqa city by trying to advance in Al Andalus neighbourhood at the northern entrance of Raqqa city. SDF has transferred around 15% of its Raqqa forces to fight ISIS in Deir ez-Zor. Clashes took place in Al-Huni, Al-Amin, Nahda, Andalous and Naem districts. Russian and government jets have targeted multiple locations in opposition and HTS-held Aleppo area. The targeted populations are Mansoura, Atareb and Urum Al Qurba. These attacks come after Sham Legion targeted government forces locations in Aleppo city. Air strikes all over Idlib continued as the government is gathering reinforcements for the upcoming north Hama offensive. Almost 140 strikes hit Idlib according to pro-opposition activists. More than 20 civilians died as a result of these air strikes. The Free Syrian Army “1st Coastal Division” has targeted government forces positions in Latakian mountains as a response. Forces in southern Idlib also targeted government forces in north Hama areas. Villages in north Hama were targeted multiple times by Russian and Government jets. 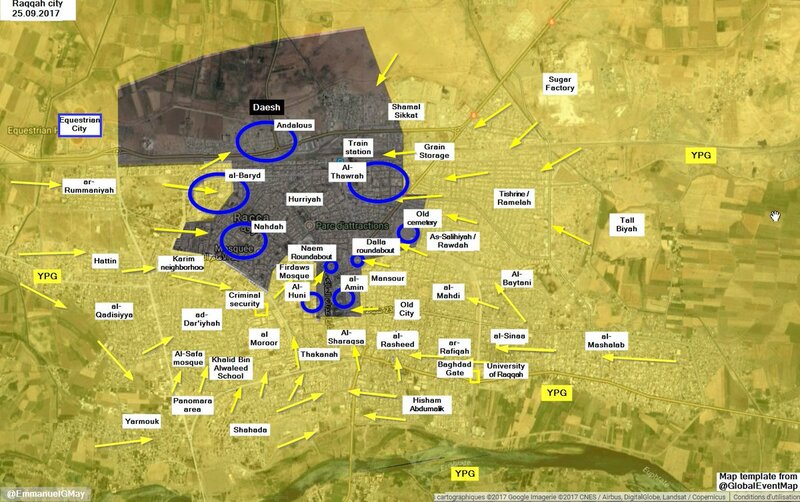 The targeted areas are Lataminah, Qal. Mudiq, Ghab plain, Hass and also Kafr Sajnah. 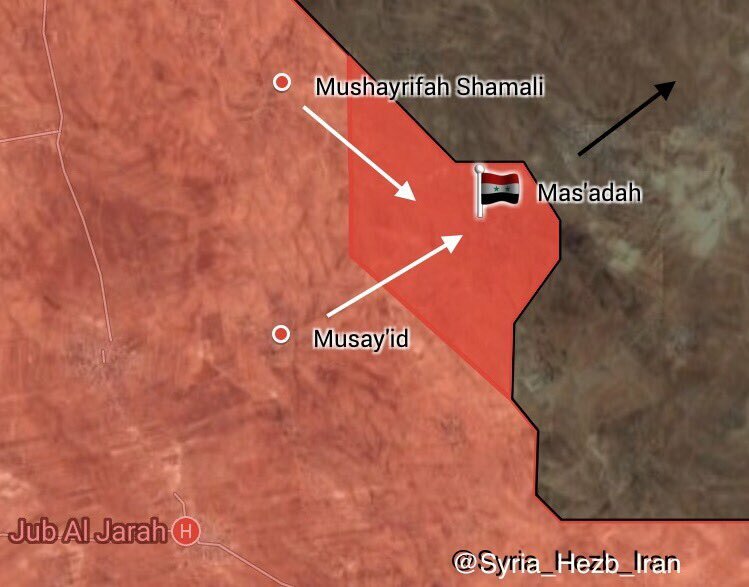 The Syrian Arab Army and allies have liberated Mas’adah village and 9 square km from IS. 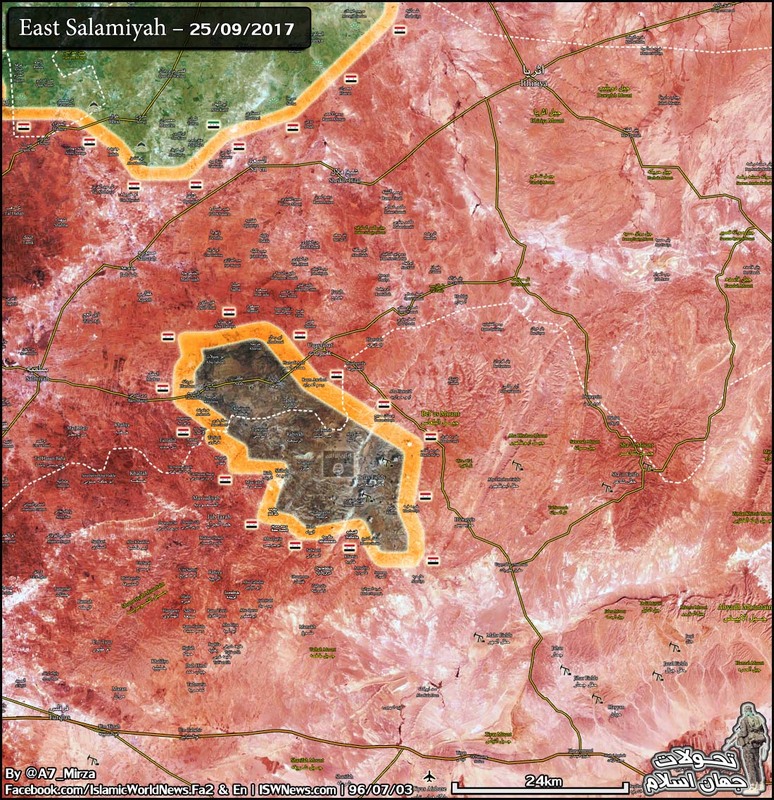 The situation on the northeastern side of the pocket (north of Uqayribat) is still unclear. Even though almost all mapmakers mark that it is as, under SAA control. It is important to remind that its a mountainous and desertic area in which direct control is very difficult to be exercised. Thus, it is possible that some IS groups and isolated patrols are still there. 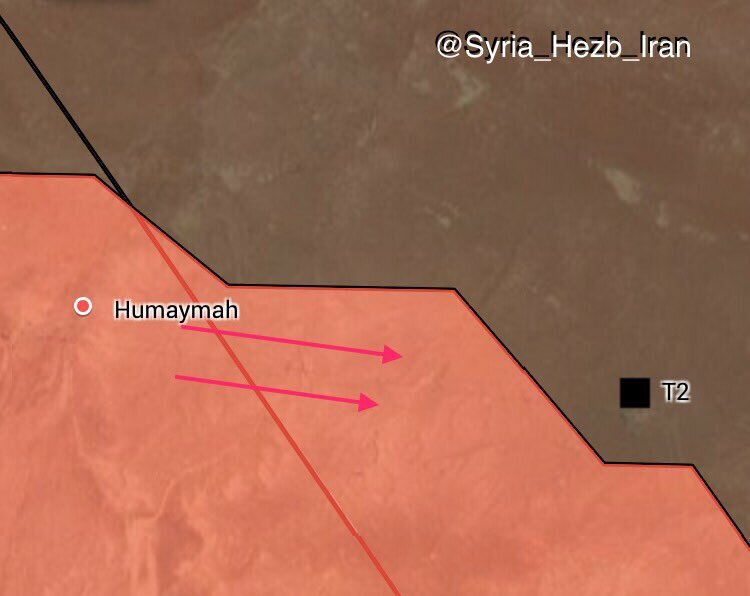 On the southeasternmost area around ISIS-held T-2 pump station, SAA and allies tried to advance from HUmaymah area. This pump station is 70 km away from Abu Kamal, one of the last strongest strongholds of ISIS in Iraq and Syria. The Syrian government forces started a new offensive in Reyhan area, northeast frontlines in East Ghouta. The offensive managed to capture some farmlands. Clashes between SAA and Jaish al-Islam also took place in Howsh al Dahra. Meanwhile, widespread SAA bombings on opposition-held areas took place. The targeted areas were Ayn Tarma, Jobar, Musraba and Douma. On the other hand, FSA forces claim to have destroyed a tank and a bulldozer in MAnasher area inside Jobar. Government forces tried to advance in Beit Jin, also. SAA shelled with artillery and targeted with helicopters some areas in an attempt to advance and capture some farmlands. Government forces stationed in Khirbet Al Ghazaleh violated the ceasefire by attacking opposition-held Dael and Abtaa, opposition sources said. 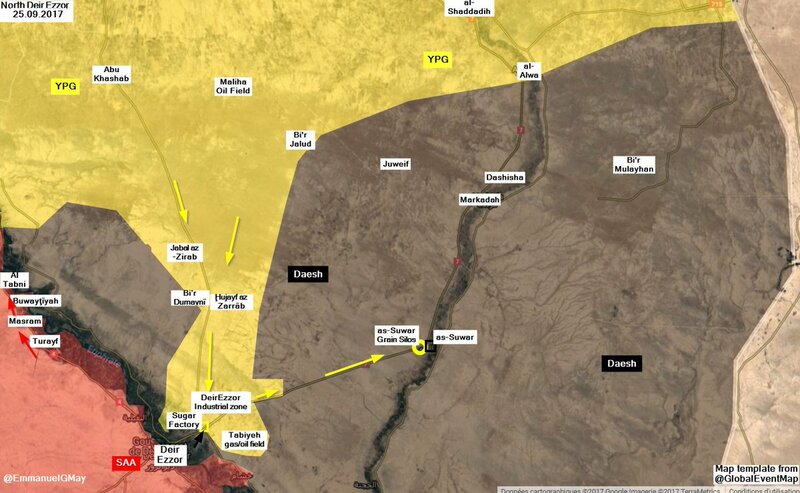 SDF advanced on the eastern banks of the Euphrates rivers as they captured Al-Kubar town from ISIS. Several Russian air strikes hit ISIS and SDF-held areas multiple times. SDF reported multiple casualties after Russian airstrike and government artillery shelling. Shelling from ISIS forces towards SDF was also reported. This active shelling comes after SDF took Conoco Gas Plant from ISIS. SDF advanced in eastern Deir ez-Zor countryside and started to storm the town of Al-Suwr. First clashes took place in the Grain Silo and the irrigation canals around the town. On the other hand, ISIS claimed to have destroyed an SDF car with an ATGM. As yesterday the CJTF-OIR media web page did not upload the military strikes against ISIS, today we will summarize the uploaded document. Note that we will sum the different strikes on each of the targets. On the 23-24th of September 2017, CJTF-OIR has conducted 65 strikes in Syria. CJTF-OIR‘s main focus in Syria is Raqqa region where they did 56 strikes supporting SDF‘s operations against IS destroying 49 fighting positions, 25 vehicles, three ISIS headquarters, a command and control node; and suppressed four fighting positions. Other areas where nine strikes occurred are Al Shadaddi and Deir ez-Zor destroying four ISIS headquarters, two ISIS-held buildings, two logistics nodes, a command and control node, a vehicle, and a fighting position. The full report on CJTF-OIR strikes conducted in both Syria & Iraq can be found here.